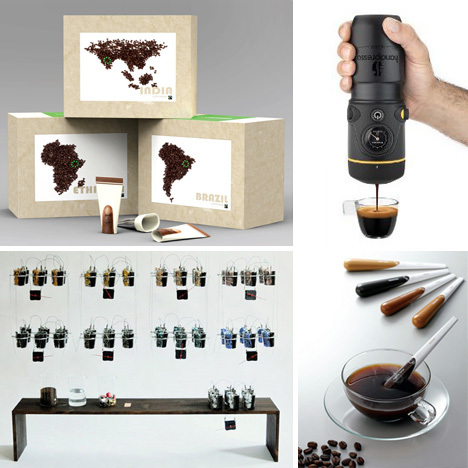 A hot black cuppa bean-infused water was only the beginning, but beyond Espressos, Americanos, Cappuccinos, Latte art and creative coffee mugs lies a world of stimulating design ideas for the caffeine-dedicated aficionado. Some are a bit green yet and perhaps worth roasting a while longer, but others are already rich with promise. Not enough space on your kitchen counter? 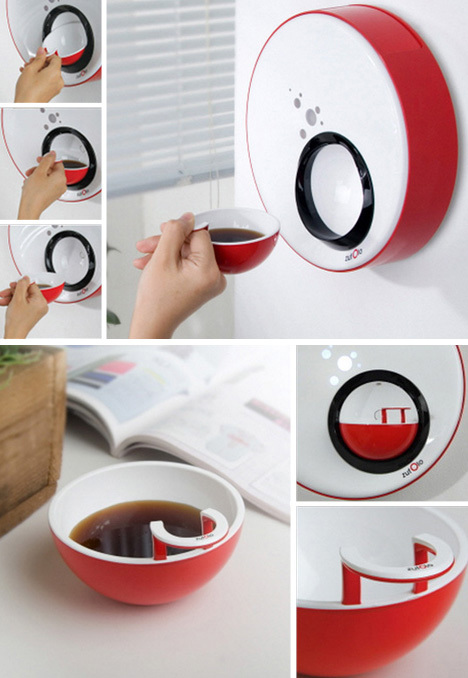 No worries: Song Ah Lee is developing a wall-mounted coffee maker for one (custom cup included) that blends into the background but remains handy for refills. No time to wait around while your morning roasts warms up? 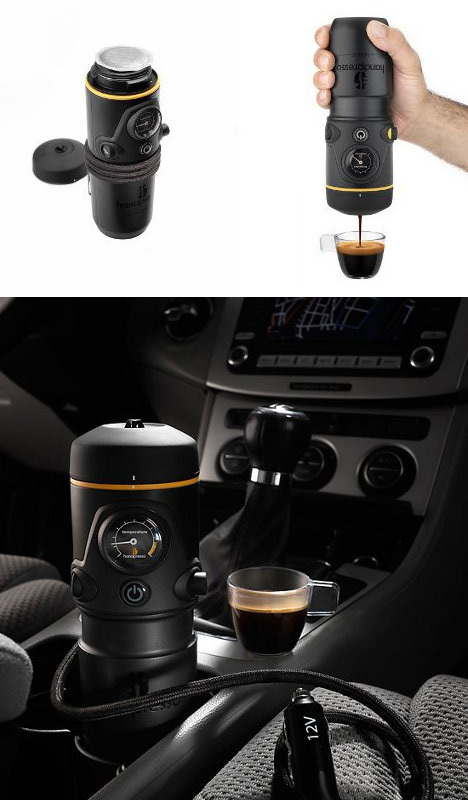 Consider brewing coffee right on your commute, instead, with Handspresso, sold as the world’s first car-worthy espresso machine – just stick to using it at stop signs and lights, please. All of these are well and good for getting your caffeinated brew going in the morning, but what happens when the heat starts to dissipate? 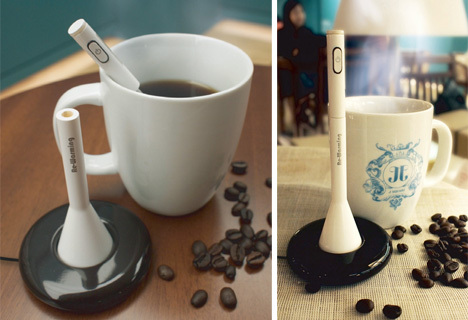 An obvious but elegant solution when you cannot refresh is to rewarm, with something like this mobile reheating stick by Hyewon Lee. Now you have made your coffee, kept it hot, and are at the office … where suddenly you cannot find your workday mug. 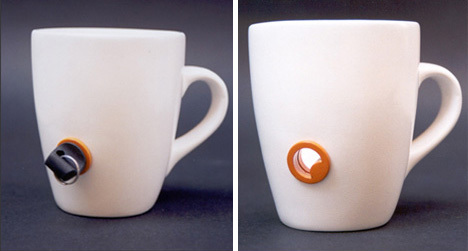 Clearly you forgot to pick up the Lock Mug with a hole specially keyed so that only you can use it! State fairs are known for putting just about anything on a stick, but coffee sounds a bit far-fetched … at first. Heo Jeong Im took up the challenge, though, and combined instant coffee packets with stir spoons to invent what he has dubbed the Cappuccino Coffee Stick. 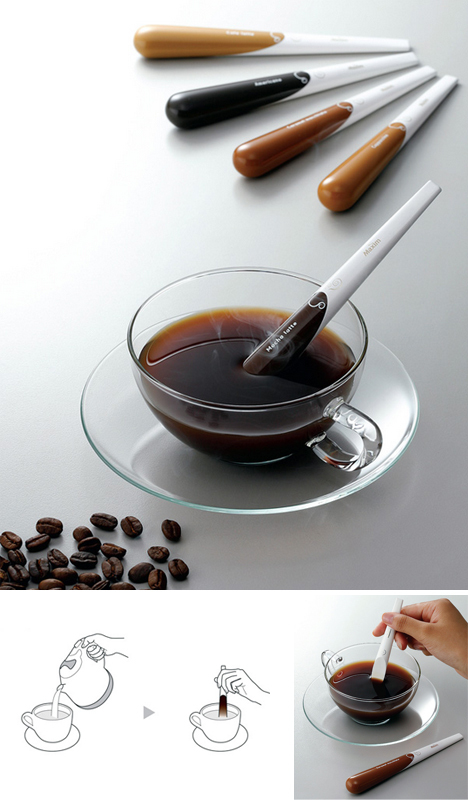 As you stir to mix your brew, the mass of coffee crystals dissolves, leaving only your stirrer behind.